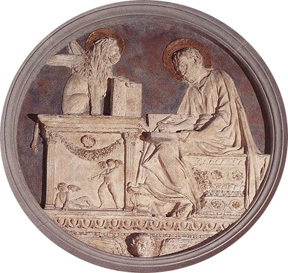 Saint Mark was the son of a woman called Mary in whose house Peter sought refuge after being freed from jail. He aided Saint Paul and his own cousin Saint Barnabas in the evangelization of Cyprus. Later, Mark became the companion and secretary of Saint Peter in Rome. He wrote the second Gospel, which emphasizes the miraculous powers of the Savior. someone to devour. Resist him, firm in you faith, knowing that the same experience of suffering is required of your brotherhood throughout the world. And after you have suffered a little while, the God of all grace, who has called you to His eternal glory in Christ, will Himself restore, establish, and strengthen you. To Him be the dominion for ever and ever. Amen. By Silvanus, a faithful brother as I regard him, I have written briefly to you, exhorting and declaring that this is the true grace of God; stand fast in it. She who is at Babylon, who is likewise chosen, sends you greetings; and so does my son Mark. Greet one another with the kiss of love. And He[Jesus] said to them, "Go into all the world and preach the gospel to the whole creation. He who believes and is baptized will be saved; but he who does not believe will be condemned. And these signs will accompany those who believe: in My name they will cast out demons; they will speak in new tongues; they will pick up serpents, and if they drink any deadly thing, it will not hurt them; they will lay their hands on the sick, and they will recover. So then the Lord Jesus, after He had spoken to them, was taken up into heaven, and sat down at the right hand of God. And they went forth and preached everywhere, while the Lord worked with them and confirmed the message by the signs that attended it. Amen. Part of the "Introduction to the Gospel According to Mark"
AUTHOR - The earliest manuscripts of the second Gospel are titled "According to Mark" (Gk. Kata Markon). This heading is not part of the original work but was added by the early Christians. It summarizes the Church's uniform tradition that Mark, a disciple of Simon Peter, wrote the second Gospel. Although Mark did not write as an eyewitness of Christ's public ministry, he was channel of apostolic tradition through Peter, who was his primary source of information about the life of Jesus. His association with Peter is evident in both the NT (New Testament) and the testimony of the early Church. (1) Within the NT, Peter refers to his companionship with "my son Mark" in 1 Pet 5:13, and interpreters have noted that the general outline of Mark's Gospel is similar to Peter's presentation of the gospel in Acts 10:36-43. (2) Outside the NT, several Church Fathers insist that Peter's authority stands behind the second Gospel. Papias (A.D. 130) describes Mark as the "interpreter" of Peter, while Irenaeus (A.D. 180), Clement of Alexandria (A.D. 200), and Tertullian (A.D. 200) echo this tradition. Few details exist about the life and character of Mark. He is known principally by his Roman name "Mark" (Lat. Marcus) but is sometimes called by his Jewish name "John" (Acts 12:25; 15:37). He is the cousin of the missionary Barnabas according to Col 4:10. More significantly, he was an associate of the Apostle Paul (Acts 12:25) and a welcome companion on Paul's first missionary journey (Acts 13:5). For reasons unstated, Mark withdrew prematurely from the mission (Acts 13:13), creating an awkward situation that later became a source of contention between him and Paul (Acts 15:36-41). At some point, however, Mark was reconciled with him and again became active in his ministry, since he is later present with Paul in Rome (Col 4:10; Philem 24), and according to the apostle's estimation, "he [Mark] is very useful in serving me" (2 Tim 4:11). Tradition states that after the martyrdom of Peter and Paul, Mark was the first to establish churches in Alexandria in northern Egypt. This excerpt from The Gospel of Mark, Ignatius Catholic Study Bible, published by Ignatius Press, San Francisco, 2001. Ignatius Press 800-322-1531 or www.ignatius.com -- see our link page.